Even under the best circumstances, the holidays are stressful. If you need to relax and unwind over the next few days, pop into We Are Yoga for a class or two. The inclusive, friendly yoga studio welcomes a diverse group of students ranging from children to seniors, and beginners to longtime practitioners, with a wide variety of classes that appeal to anyone looking to get their Zen on. "I love the people of We Are Yoga," studio director and co-owner Sarah Ricketts says. "Our students come from varied backgrounds, industries and life experiences." Ricketts and her team have recruited a group of teachers that is just as diverse as their clientele and extremely passionate about expanding their knowledge. "Our teachers are also students, attending class in addition to their normal teaching schedule," she continues. "Many of our students also pursue their [yoga] teaching certification, which continues to build and strengthen our community." Ricketts is proud of the atmosphere they've created. "When I walk through the door, it makes me smile and reinforces why I embarked on this journey," she says. Though the studio has been around for several years, she became co-owner a little more than two years ago. Classes include basic yoga, vinyasa flows, children's yoga, meditation and more. 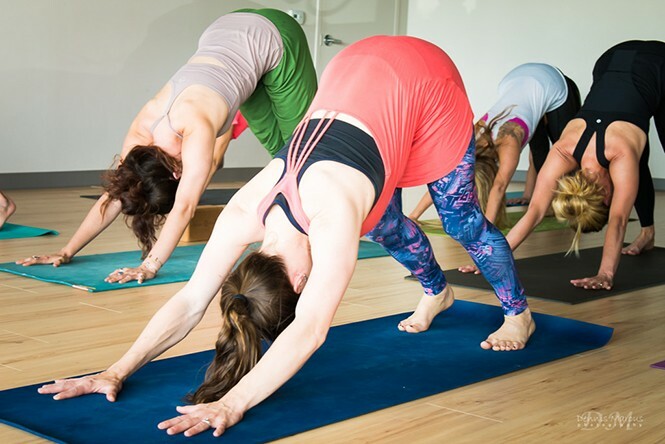 That variety means that the studio can accommodate many different schedules and different levels of experience—from the brand new client who has never even heard of "downward facing dog" to the experienced yogi who wants to learn how to teach. The number of classes also helps busy people find the time in a packed schedule. "Plus, we have one of the best views of the valley," Ricketts says. "Depending on the time of year, students often get to enjoy spectacular sunsets over the Oquirrh Mountains while practicing yoga." The staffers love sharing their passion for fitness—both physical and emotional. "Every time I come to work, I feel like I am home, and I always leave feeling better than when I arrived," says Rachel Posner, a class instructor and the director of the studio's teacher training program. "I feel supported, appreciated and nourished. ... What more could you ask for?" We Are Yoga offers a wide variety of payment options, including single drop-in rates, punch passes and unlimited memberships. They're currently running a new student price promotion as well—unlimited classes for two weeks at $39, or unlimited classes for a full month at $69. If you're in need of any accessories, such as mats, bolsters, blocks, bags or clothing—check out the studio's retail selection while you're there.